The declaration of financial assets and liabilities as a prerequisite for contesting elections has become a joke. As a personal confessional offering a peek into the probity of the candidate (and his/her family), the clause is unexceptionable. But at the hands of wily politicians, their lawyers and auditors—and individuals and institutions happy to look the other way—the affidavit has become just another piece of paper. Bogus numbers are bandied without batting an eyelid, but neither opposing candidates nor the Election Commission, or the income-tax department or the media, are interested in digging deeper to establish their veracity. Even the supposedly wise voter, it seems, cannot be bothered about such niceties beyond a point. A good case in point is the honourable Member of Parliament from Amethi Lok Sabha constituency, Rahul Gandhi. # In 2004, he declared total assets of Rs 22 lakh. In five years, the assets of the first-time MP have shot up 10 times to 2.25 crore. # In 2004, he held bank deposits of Rs 11 lakh, £30,000 and $19,200; shares of Rs 3.9 lakh; LIC and other savings certificates in Rs 3.80 lakh; jewellery worth Rs 1.25 lakh; and a farm house worth Rs 9.8 lakh. # In 2009, he holds bank deposits of about Rs 20 lakh, LIC and other savings certificates of Rs 10.2 lakh; land worth Rs 40 lakh, jewellery worth Rs 1.5 lakh; and two shops in a mall worth Rs 1.63 crore. What is the one question you are dying to ask Rahul Gandhi about his assets and liabilities? Keep your questions short, civil and proportionate to your known source of income. 1,611 per cent jump in assets in five years. Hello! This entry was posted in Issues and Ideas, Just One Question and tagged 2009 Elections, Affidavit, Churumuri, Election Commission, General Elections 2009, LIC, Rahul Gandhi, Sans Serif. Bookmark the permalink. You have declared your assets. As per what I saw in The Hinhu, you have a total area of 4.692 acres of land in Delhi worth Rs9.86 lakhs. Can I buy this from you for Rs10 lakhs please. Or will you sell this to the Income Tax dept for this amount? what was your investment strategy, rahul? Why did you not do so? Humble? Oversight? Over-confidence? Don’t care? Forgot to get reminded? Churumuri and ‘The Hindu’ seem to have a fetish over the asset declaration by the candidates. Its news I accept but why do they always spare the people from the so called left parties, has none of them filed nominations yet? Do all of them have assets that are well within what we can imagine ? I seriously doubt.. can we have some light on the assets of the “left’s” candidates please… ?? What is Rahul Gandhi’s educational qualification? Has he worked for someone or the other and saved money before entering politics? 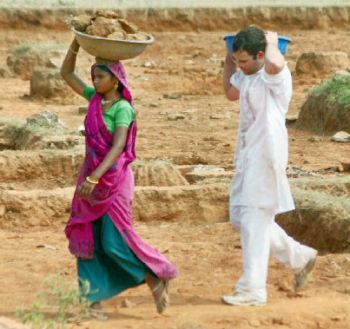 What does Rahul Gandhi do for a living now? Is the honarorium paid by Congress for being its General Secretary sufficient to add to an impressive figure of 2.25 crores? In fact, this question can be asked of everyone from Pandit Nehru downwards. None in the family, except Rajiv Gandhi for some time, were gainfully employed. How has the first family of India continued to remain rich? Few weeks back, Churumuri had raised similar question about RV Deshapande, whose wealth had shot up from Rs.11 crores to Rs.145 crores. No one even batted an eyelid. This business of declaring the assets is a dumb charade. Actually, it should be backed by the IT returns, and statement of afafirs filed with IT department from time to time. If the particulars given in an affidavit are going to rot in the files of State Election Commission, it serves no purpose at all. We citizens can do nothing more than ogling at the wealth of these ‘servants of public’. For a change, these affidavits should be forwarded to the jursidictional IT assessing authorities and they must undertake scrutiny assessment of the returns filed by all the politicians who are now contesting in the polls. Just as they take oath in the name of God/Religion/ etc., what they declare is one and what they have is another. And knowing well what an MP or MLA gets in the form os salary, perks everyone can caclculate their income. The “inside” earnings, nobody knows a or reveals. An honest worker or employee even after serving for 30 to 35 years will be in debts by the time he retires. Let us not take their income declaration prima facie. It hides more than it reveals. The IT department always tries to harass an honest tax payer by putting hundreds of questions. The politicians are a insulated lot. May their tribe increase. Tamma nijavaada hesru enu swamy? your uncle brought in maruthi to india. your grandma nationalised it. you live in age of nano but you don’t own a car?? how do you travel from your one declared property to another?? Do you know what rate of interest your PPF is earning or even the way to the nearest postoffice where you deposited the money??? U need a 2nd hand car i have mine for sale. great condition good miles/gallon u need it?? Do you have similar affidavits for Namma devegowda since he is MP? Rahul neevu bili hendranna karkondbarthira? You are quiet safe Rahul. Chirajevi has 4092 Sq. Yards of property on Mount road Chennai worth Rs2 crores. The Central and the state governments are rich enough to buy these properties and later sell it to the public at 100% profit! Why is this not done? How much profit does your family make out of Nehru’s works? If that royalty is secured in a trust, what are the trust’s activities? Can we see a statement of account, please? Why was the deal with Oxford to print Nehru’s works and sell them at affordable price, discontinued? Since it is mandatory for every taxpayer funded library in India to buy these books, I know it is one huge chunk of money that you get. Do you plan to increase the copyright term again before 2025? May because your grandma disinherited Maneka and Varun, he hasn’t inherited Nehruvian Socialism™, why don’t you try giving a small share of the booty, he may come back to the right path. Did you drop out of Oxford or Harvard ? Compared to Rahul his mother Sonia Gandhi has no house of her own, no car and virtually very little in the bank and yet she is the most powerful woman in India! During a downturn, your assets have magically shot up 10 times. Given your skills as a political campaigner, are you better off as a financial advisor? Since you are an FAA certified Private Pilot, will you be flying yourself to campaign for the elections? Based on a news item published in the Kannada Prabha (7th Apil,2009,p.7):Rahul Gandhi doesn’t remember what he learnt in the Cambridge.According to the affidavit filed by Rahul he completed M>Phil in Developmental Economics in 1995 in the Trinity College. Not only the year even the Course is wrongly mentioned. According to the Univeristy ceritificate it was in 2004-05 that he completed and the course was Development Studies. And to cap it all, out of the 4 subjects he studies he has failed in”National economic Planning and Policy’, he has secured 58% whereas in the Cambridge the minimum for a pass is 60%. Comments awaited. It seems that the aspirant for the highest job in India neither need be qualified, nor truthful. If the claim of RG is not plain untruth, at least it smacks of rank incompetence! Let us forget about declaraton of their wealth, at least they must be honest enough to admit about their qualifications. Even if somebody fails even by a single mark he is deemed to have failed. And that too when yu have your educaton in a prestigious university and college at least you should not do injustice to your alma mater. It amounts to betraying ones mother. Why should you be entitled to become the country’s PM when there are millions of better people poised to rule and at least hundreds within your won party. This time around no such ownership is claimed. Wonder what price the company was sold for and when? Is anybody aware. I believe our politicians just do not have the guts to declare their true assets. Mr. Rahul Gandhi, what would be your part in the development of India as an individual person? How much amount you can spend from your personal assets (without waiting for govt. funds) on the worker, working in the picture with you?